REFLECTIONS: Spring Break!!! I am far behind on my school year goal to Re-fashion 10 items per month. My Spring Break goal is to complete one item per day for the next 10 days. 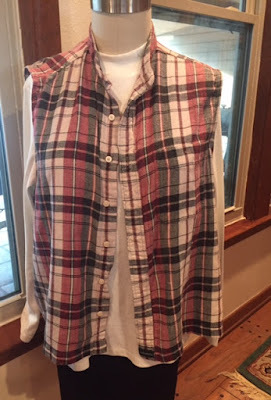 Re-fashioned years ago from men’s shirt. I made the sleeves too short for easy wear over long sleeves. Too snug for easy layering. Open side and sleeve seams. Leave sleeve cap seam. Clip the sleeve seam. Trim sleeve 2” from seam. Serge. Turn to make arm-hole facing. Topstitch. Cut and insert side panel cut from the sleeves. I did not taper the panel so it would make an unfitted vest. Serge, topstitch. AFTER: Casual lounge-wear vest to layer on cool mornings. Perfect while sewing over Spring Break! Perfect for Spring Break sewing! 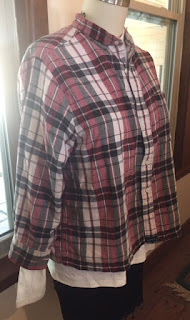 AFTER: Did not taper for loose fit with layers. Match on only one side. 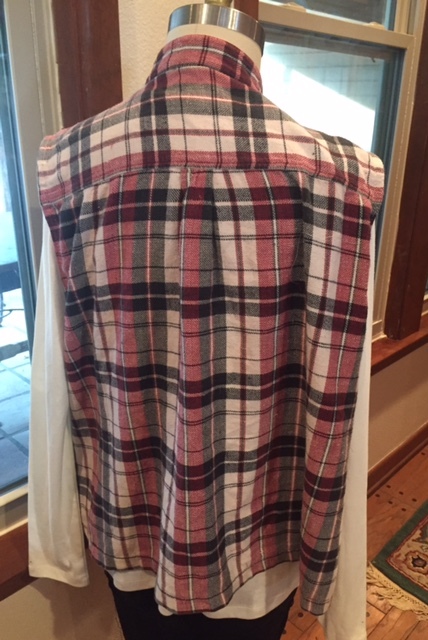 What a cute plaid, 10 projects in 10 days! Can't wait to see them. This is the perfect in-between weight for some days, just enough to keep the core warm but not overly hot.